Donavan joined the international dressage scene schooling and competing in Florida at Intermediaire II and Grand Prix with Jessica Jo Tate this winter. USDF All Breed Award at Intermediaire II for 2001! A 60% average. This of course with Jessica Jo Tate aboard. We are so proud! at Wyngate Dressage Center and Wisconsin Equine Clinic on a segment of Outdoor Wisconsin for Public TV on Thursday, January 3rd (pm) and Saturday, January 5th (am). It was about Wisconsin Dressage, a stallion, and care of such a sporthorse. after being approved by the Canadian Sport Horse Organization. One of the most recent Donavan! 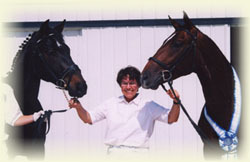 foals, a colt, was born late July 2001 in Canada, out of a Hanoverian mare. He was early and had a rough start, but is now doing great. His name is Dubé (pronounced Doo-bay). He's a dark bay with four white socks and a snip like dad! His owner, Kirsten Keene of Kaiser Stud, has sent photos for our page featuring Donavan offspring. Kirsten has another mare in foal to Donavan! 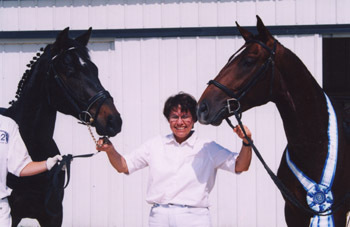 for 2002, a lovely gray Hanoverian mare named Espresso. Riverland Farm's Teerose IS pregnant by Donavan! due late July 1 of 2002. Sugar, our beloved Mustang mare is pregnant by Dazzler, a Canadian stallion from Jubilee Farms (see link for more info. on Canadians). She is due May of 2002. Since she is a buckskin, most say the foal will be black or buckskin, so we will see. Any bets? Riverland Farm's indoor arena footing is done, and now we are looking for a great excuse to have a party at the farm where Donavan! can try out the new Perma Flex® for all of his friends and admirers. He has been "home" for a year now, so that is good reason. On his way to Regionals and Devon! Congratulations to Margaret Goodell of Sullivan, WI. For more information about this win, please visit Draco's Page. Damla Benz, '96 filly, won the Mare Championship over stiff competition, earning over 80% from Hilda Gurney at the Sorensen Show, in East Troy, on August 2nd. "Elegant Mare!" Congratulations to Sue Reifenrath of Richfield, WI. On July 24, 2001 "They made their daddy proud!" Two 2-year-olds, in Get of Sire Class, won the blue against excellent competition: Duesenjaeger, (Pilot) '99 gelding, owned by Wendy Costello of Mequon, WI, And Drachen Herz, '99 colt owned by Margaret Goodell of Oconomowoc, WI. Both of the boys were showing in their first show. Sire Donavan! watched from the side, after earning a terrific 61% at FEI Intermediaire II, for the blue. on May 19, 2001 with a first place at Intermediaire II. For more of Donavan's 2001 show results, please visit the Show Results Page. Born in May, 2001 at Riverland Farm, Mequon, Wisconsin. Winteroza is for sale. Please visit the Sale Page for more info. At the Hanoverian Inspections, Winteroza was declared "a very pleasing filly."